Bulldog Announces Amazing New Deals! Bulldog Licensing has launched the licensing programme for The Crystal Maze – with two partners already signed up for the revamped game show. The Crystal Maze originally aired on Channel 4 from 1990 to 1995, achieving cult status by pitting teams of contestants against the fiendishly difficult puzzles of the Maze. After a hugely successful Stand Up To Cancer celebrity special in 2016, the show has now returned to Channel 4 for a full series. 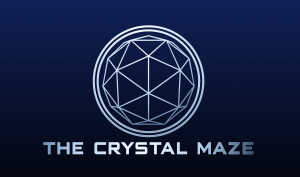 Hosted by maze-master Richard Ayoade, the new series sees teams face a new range of challenges as they attempt to navigate the Aztec, Medieval, Industrial and Future zones of the maze to win crystals that equate to time in the final challenge – the Crystal Dome. The new deals will see Rascals produce board games, card games, puzzle games, and travel games based on the show’s format. Poetic Brands is also on board for adult T-shirts, nightwear and underwear.